I've been MIA lately ~ wedding season has hit hard this year! I couldn't wait to share a picture of this Seattle Seahawks garter set I recently finished for a former co-worker's mom who is getting married this summer. 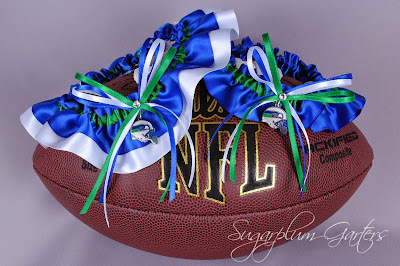 As a Seattle native, I've always loved making Seahawks garters, especially in the team's vintage colors. Making this set was bittersweet though ~ I can no longer get the charms in vintage colors, so this set is the last of its kind. I hope Marge and her new groom enjoy it!